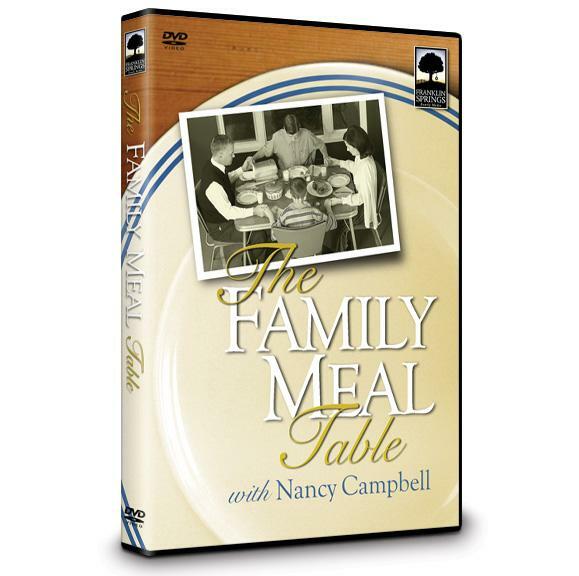 My family and I recently watched The Family Meal Table with Nancy Campbell. We have been wanting to utilize our meal time as a greater time of fellowship and discipleship. This dvd was a great encouragement to us. Nancy is a true character. She explained discipleship and the importance of the table in a fun and helpful way. Speaking from Psalm 128, she told about how a woman was in the heart of the home and gave the picture of the flourishing children sitting around the table. Seeing her daughter and her granddaughter were a great help to me as well. They shared about the wild and fun times they had exchanging ideas and questions about the passages I read. This is not a boring, legalistic venture. This is a great way to help your children learn to love scripture and vocalize their questions and ideas. I greatly encourage you to revolutionize your meal time for the benefit of the whole family. Nourish the body and soul. I felt like I was being discipled in this dvd. I am grateful for that because I do not know of anyone around me that does this that I could glean wisdom from. Buy this movie at Franklin Springs. I sensed Jesus giving me a vision of doing this when we moved here, to Florida. I knew this was something important to do. Thank you for leading me to pray and carry on to this goal. I love you.